An elite military group goes out to find a black-ops interrogation ship that has gone radio silent. What they find isn't really what they expect. I found this movie to be mildly interesting but they lost me in the last 15 minutes. I just don't get it and - considering my lack of invested interest in the film - don't care, either. One of many follow-ups to the Ju-On movies, this one follows a cursed patient in a hospital and all the usual hauntings that surround her. Exactly what you'd expect with no new ground broken. A companion film to Ju-On: Black Ghost (see above), this one was pretty good. The cursed old lady is quite nightmarish and I had a feeling of dark dread throughout the film. Best of the Ju-on mythos after Ju-On 2, imo. Excellent documentary detailing the history and culture of metal music - how's it's impacted society and changed the world. Quite a lot of attention is also devoted to explaining and defining the various metal sub-genres. Very well put together making it both a treat for headbangers and an informative glimpse into the metal sub-culture for those who are not. Boy was I surprised. I heard this movie was pretty much all talk so I didn't expect too much from it. As it turns out, this film is fascinating. It's basically about a guy who decides to tell his colleagues that he's been alive since the dawn of man and the discussions it generates are philosophically, intellectually and spiritually quite intriguing. Excellent! The sister of the teacher in Ju-on: The Beginning of the End is now involved and she thinks she can finally put an end to the whole affair. Relying more on jump scares than the atmospheric creepiness of the early films, this does have a few good ones. Still, we've all become far to used to all this by now. There really isn't anything new here. Even Norman is getting a bit stale. Anthony Perkins tried his hand at directing this one and I think he did a very nice job of it but the film really needed a better story for him to work with. What would you expect from a film exploiting the success of Ringu and Ju-On by bringing the two cursed characters together to duke it out? Exactly this!! Mildly entertaining in its own goofy way. This one centers around an incredibly smart but unethical policeman who discovers a puzzle box at a horrific crime scene. Of course, he opens it and encounters pretty much what you'd expect. Not a bad entry in the series ...although it may be somewhat confusing at the end. Just keep in mind that once someone opens the box, anything can happen. Some good scares and interesting twists and a couple of really fresh new cenobites. There's a manhunt going on for a high profile drug lord who is expected to pass through a small little town just north of the Mexican border and the sheriff is not about to let that happen. Maybe it's just because I like Arnold Schwarzenegger but I found this film to be just plain fun. Lots of action, a few good jokes, sociopathic villains, good shoot outs and more. What's not to like? After making 2 terrific VHS films ...what happened? There isn't a single story in this one that measures up to any story in V/H/S or V/H/S/2. Makes me sad. This could shut down a franchise that was truly original and one that I was really looking forward to what would happen next. The trailer, which contains all the best moments, makes it look far greater than it is. A rather vile and disgusting exploitative revenge movie which focuses on a woman being attacked and raped for about 45 minutes and then on her brutal acts of revenge. Even though this film is the inspiration, it's not nearly as imaginative as the 2010 reboot. Watch that one instead. Roger Corman at his best with this bio-pic about the title event. One of the most historically accurate films I've ever seen, complete with a narrator to fill in the names and dates of all the events and participants. If you haven't seen this Capone era masterpiece, you've really missed one of the best gangster films of all time. Jack Woo's last Hong Kong film before coming to the states, he went balls out on this non-stop action, crime thriller involving 2 cops stuck right in the middle of a major drug war. Highlights include some of the most incredible stunts I've seen, a single shot traveling gun battle that goes on for nearly 5 minutes, electric performances by Chow Yun-Fat and Tony Leung, and, holy crap! What a body count!! Riddick is hired to help in the war vs. the Necromongers. He's not interested but he gets dragged into it anyway. Exceptionally good sci fi with Riddick at his best. Good characters, good story, awesome special effects, and a lot of Riddick's history if you watch the extended version. In fact, I think one of the reasons this didn't do as well as it should have was because it was missing a lot of the back story found in the extended version. What a sad follow up to a classic comic horror film. The only story in this one worth watching is "The Hitch-hiker" and even that is not as good as any of the stories in the first film. They forgot to include any of the Creepshow wit and charm in this one making it just another run-of-the-mill horror anthology ...and not a very good one, at that. Riddick's first film takes place on a planet with multiple suns making in perpetual daylight ...except once every 22 years when an total eclipse occurs. That's when the creatures come out to play and all hell breaks loose. Tense, action-packed story with everyone not sure who to be more scared of ...the creatures or Riddick. Quite a worthy introduction for our anti-hero with more adventures to follow. I found this sequel to Ringu to be slightly more active than the first film but far more confusing ...I lost the plot somewhere along the way and never found it again. It just didn't seem to flow very well ...despite a couple creepy scenes. A candid view of one of the 20th century's finest composers. Multiple interviews talking about comedy, home life, politics, his irreverant and totally honest views on life in general and, of course, his extensive library of music. 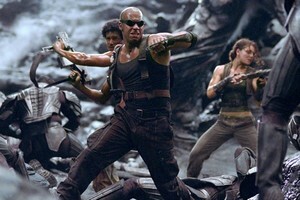 After being unceremoniously dumped by his fellow Necromongers on an unknown world, Riddick must fight to survive and find a way off planet. The third Riddick film is basically just a different version of the first film, Pitch Black, with a different set of characters. In that film, the monsters came out when it got dark. In this one, they come out when it rains. The rest is just the interplay between characters. But, that was good enough for me. It's really good fun. Three young people break into an old, blind man's house to steal $300k. They didn't count on how resourceful this man can be or that getting out is going to be far harder than getting in. ...and how about that secret in the basement? A full throttle, roller coaster ride of a thriller with Stephan Lang putting in a stellar performance as the blind man who's more dangerous than the monster from your worst nightmare. A real ho-hum vampire movie about a family that has a rare condition that forces them to drink blood and has to move around a lot because they keep killing women. And what's hiding out in the shed? I think this films biggest problem is the characters are not particularly likable and not even the twist ending could save this film. Skip this one and go for the sequel instead. It's much better and you won't miss anything by not seeing this one first. Found footage style film about a bunch of ghost investigators investigating a ranch which seems to be a hot spot for UFO and other unexplained phenomena. They were asked to come out by the ranch owner who's son simply vanished during a birthday party. Beyond a few spine tingling moments and some really nightmarish imagery, there's nothing here we haven't seen before. One of the best caper movies ever made with one of the most phenominally profound twist endings ever. Everything about this movie - the story, the acting (especially the excellent performance by Kevin Spacey ...despite what we know about him now), the dialogue - works!! If you haven't seen it, you're missing a good one. 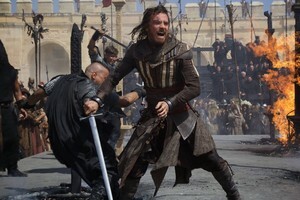 Yes, there are action movies that are really nothing more than action movies. This is one of them. But, even an action move can be fun to watch and I found this one tremendously exciting. You won't find any depth here but you will find some exceptionally good escapist entertainment. Excellent real-life biopic of Navy Seal Marcus Luttrell, the sole survivor of a reconnaissance mission in Afghanistan. The strong personal and emotional interaction between friends and comrades is punctuated by gripping and realistic scenes of warfare as the group struggles to survive. Very well made, heart-felt film. The first made-for-TV film by PBS is probably still the best film they ever produced ...and on practically no budget. Bruce Davidson gives an incredible performance as a man who dreams and everything changes, and how a dream specialist tries to manipulate him with dire consequences. Fantastic dialogue and a mind twisting storyline makes up for the nearly laughable special effects. Don't be misled by the 2002 remake ...which was just awful. Watch this one and watch it now! Great movie except...**SPOILER ALERT** Why would a super intelligent guy who's managed to get deep under cover with one of the world's more dangerous terrorist cells suddenly decide to go see his sister when he knows she's being watched. That's just stupid and makes absolutely no sense. If it wasn't for this bit of idiocy, I would have rated this film much higher.